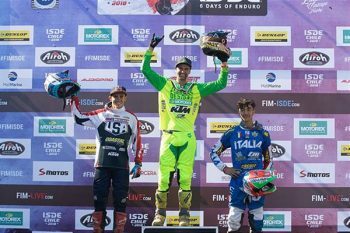 Reigning Australian champion Daniel Milner has taken a triumphant overall victory at the 2018 International Six Days Enduro (ISDE) in Vina del Mar, Chile, leading Team Australia to the World Trophy win. KTM Enduro Racing Team’s Milner was unstoppable in dry, technical conditions against the best off-road racers on the planet, establishing himself as the class of the field on his way to winning aboard the KTM 500 EXC-F.
Milner was third outright on the opening day and then topped day two, which boosted him to second on the progressive time-sheets while also taking control of the E3 category at that point. By the halfway point following day three, another commanding performance saw Milner take charge of the lead on combined times. 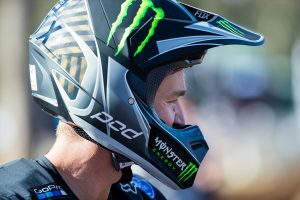 After again leading the way on days four and five, Milner carried a 1m27.62s lead into Saturday’s final moto, in which rode to a calculated eighth-place result and extended his final advantage to 1m54.48s as a result. In E3 he won by over two minutes to cap-off an incredible achievement. Fellow KTM Enduro Racing Team regular Lyndon Snodgrass was unfortunately put out of contention early, albeit still being a valuable part of Team Australia’s World Trophy efforts. 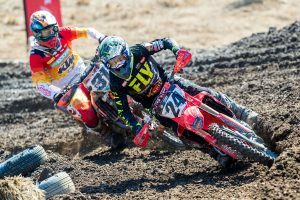 Riding the KTM 250 EXC-F in E1, he was sixth in class on day one, however human error in the pit caused a loose sump-plug to fall out on day two and rule him out of the event altogether. KTM Australia also supported the Women’s World Trophy team through ISDE debutant Mackenzie Tricker as they captured a sixth-straight victory. Individually, US-based Tricker was ninth aboard her KTM 250 SX-F. The Junior World Trophy team from Australia collected fifth overall for the week, including KTM-mounted Tom Mason, who rode his KTM 500 EXC-F to 16th position in class.